This is an archive of past Oblivion talk:Weapons discussions. Do not edit the contents of this page, except for maintenance such as updating links. 7 range and speed of mace? 31 Should the others really be others? 34 How do I add custom weapons? 36 Fine Steel Claymore/Other Fine steel weapons loacations? I think the formula needs at least a few extra notes, or preferably to be extended... Fatigue modifier? Weapon wear modifier? Power attack vs normal slash? And of course enemy's armour, shield etc damage reduction. The formule also doesn't work with bows, i'm not sure but maybe strength must then be replaced by agility. And is weapon damage then bow damage + arrow damage? I'm fairly sure fatigue and weapon condition are straight % modifiers. 50% fatigue means you do half as much damage. 50% fatigue and 50% condition mean you do 25% damage. I haven't tested it yet, but it seems plausible. I'll look into it (and bows) when I get the chance. It seems to me Fatigue is more of a cost type system. Much like magica is to magery. When you swing the weapon it cost so much fatigue to do so. If you don't have enough fatigue to pay the cost you use what you have to get a fraction of the damage. i.e. If you only have enough fatigue to pay half the cost you would do 50% of the damage. Just the way it seems to me, havn't done anything to prove this. Just my personal experince is I still inflict full damage when my fatigue is below half. This Formula seems, well, just wrong. Weapon conditon and Fatigue should probably be in there, but that aside, the numbers just don't add up. Consider 100 strength and 100 skill. You get -> weapon damage * .08 * 8.5 = .68 * weapon damage. So even with all your stats and skills maxed out you can only do 68% of the damage listed for a weapon? And I still don't think that the question for bow damage has been addressed. How does arow damage ratting and the bow ratting add up to get the value to use for your wepon damage? Cloud Ruler Temple. Either steal it or join the Blades. What about the base damage for hand to hand? So, somewhere in there is the base damage for hand to hand. Umm... from TES website, "The base amount of health and fatigue damage done is based on the attacker's hand-to-hand skill and luck, and as with weapon attacks, that amount is further adjusted based on the defender's stats.". What's wrong with this picture? Where's strength fit in? range and speed of mace? It has been reported that blade weapons may become blunt and vice versa. The damage rating is the damage per hit. Any enchantments are also per hit. For sneak attacks, the damage for the single sneak hit is six times the weapon's standard damage (assuming your sneak level is at least 25). So for maximum sneak damage, it's best to use the one-handed weapon with the highest damage (as currently listed in your character's inventory). Melliwin of Dunbarrow Cove sold me a Daedric Bow when my avatar was level 25. This seems to contradict the information on the weapons page that indicates (to my understanding) that Daedric is only available from loot and not from merchants. Is this unique to the downloads? Are they taken into consideration in relation to the level available list? Changed from "never available from vendors" to "never available from vendors available before plug-ins". Hope it doesn't end up too misleading and like you said editing is a major point of a wiki, right? If it needs fixing I am sure someone will do so. Ok, I was wondering about the base damage for Bound Weapons. I summoned a Bound Dagger, and it wasn't as good as a Glass Dagger, and Glass Weapons are not as good as Daedric Weapons. So if anyone could tell me what the Bound Weapons' damage is similar to, that would be great. Anyone have calculated dps values? Overall, Blades are superior to Blunts in virtually every case, regardless of what fighting style you prefer (Speed vs Reach, etc). Battle Axes are without exception inferior to the equivalent Claymore, as they have the same Speed and Damage, but with less Reach. Maces are without exception inferior to the equivalent Longsword, as they have the same Reach and Damage, but are slower. Warhammers have the same Reach as Claymores, with fractionally more Damage, but are significantly slower. The same goes for Shortswords/WarAxes. Daggers have no Blunt counterpart (or even anything remotely close), which is critical to close-in (i.e. max DPS) fighting styles, since the majority of a weapon's damage nearly always comes from its enchantment, even at very low levels and just using Sigil Stones (let alone exploit-laden custom uberweapons). 1. When I pick up arrows, my game seems to only allow me to carry 'quivers' of 110 of each type, even though I might have more than that in my inventory. Is this right? 2. I have hot-keyed '2' as my arrows, but when I pick up new arrows of the same type, these are not included when I hit the hotkey. They stay in their own 'quiver'. 3. If I hoarde arrows in my house, is there any danger of putting hundreds/thousands of arrows in one big pile in the same cupboard/chest? I notice the merchants sometimes have 200-250 arrows in one pile; should it work for me? Thanks. Of course I going to have to do a bunch of Guild quests, but anything for Elven armor. Should the others really be others? I was wondering since Akaviri Katana, Ancient Akaviri Katana, Steel Cutlass and Sharpened Cutlass all have the same general statistics(speed and reach)as longswords shouldn't they belong in the longsword section rather than in a other section? I was wondering if there are other people who agree and if this matter should be taken into consideration for editing this page in the future. How do I add custom weapons? Basically, I'm trying to make a mod that gives you weapons when you rank up (apprentice, journeyman, expert, master) any melee class skill (blade, blunt). For now, I'll manually do that in console. But, how do I make custom weapons in the Construction Set? How do I get NIF and DDS images? Fine Steel Claymore/Other Fine steel weapons loacations? I have had this game for a while and have just come accross a fine steel longsword (and bow, but it looks identical to a steel one. Also just found a shortsword)and can't seem to find any other fine steel weapons, a Fine Steel Claymore in particular would be nice). 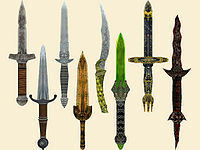 I'm trying to collect each type of weapon in the game and would greatly appreciate it if anyone could point me in the direction of the locations of fine steel claymores, shortswords, daggers, etc. I have tryied looking all over the UESP Wiki and can't find specific locations. Please and thank you! I have now found a fine steel mace and another shortsword thanks to your advice, SneakyPenguin, thank you! I actually found out from a friend over Xbox live that a Fine Steel Claymore can be purchased from the Chorrol Fighter's Guild blacksmith in the basement at around 9:00 a.m. if that helps anyone else questing for these weapons. I now have a Fine Steel Shortsword, Longsword, Claymore, Mace, and Bow. I'm still looking for a Dagger, War Axe, Battle Axe, and War Hammer. If anyone has any information on these weapon's fixed locations I would appreciate it. I found it at Fort Scinia around the entrance somewhere. It looks identical to a Steel Bow it just has 1 higher base damage. If you're looking for a good low level bow that will hit ghosts, the Imperial Legion Forester that hangs out in front of the Inn of Ill Omen carries a Silver Bow if you dont mind pickpocketing him while he sleeps (if he ever does?) or just killing him when he's target practicing. I Have all of the fine steel weapons and use them all the time. They are great for training. I am aware that you can buy all of them, that is how i got all of them. I'm level 12, I just started a new game, and they are all available to buy. Sorry I can not give you more info. Good luck finding all the weapons. P.S. dont forget to collect the dramora weapons as well. I have a possibly stupid question. How do silver bows and arrows work? Let me elaborate. Do you need both a silver bow, and silver arrows for them to harm ghosts? or will one work without the other? Anyone know where to find a Daedric claymore or at least know where the best chances of getting one are at? My old Bound one isn't cutting it anymore. This page was last modified on 9 June 2013, at 20:43.